Aerodynamics can be used to control the handling of a car in high-speed corners (greater than approximately 60 mph). Aerodynamic components push down on the car, or create downforce, which helps the tires maintain better traction. The two main aerodynamic upgrades are front bumpers and rear wings. While these two components can increase cornering speeds when installed on your car, they will also increase drag and limit your top speed. Aerodynamic components should only be used to tune high speed cornering characteristics. They will have little or no effect on low-speed handling. Additionally, aerodynamics should be relied upon to increase the overall grip of your car. It should not be used to correct severe understeer or oversteer. Try to rely upon mechanical suspension tuning to control understeer/oversteer. Only turn to aerodynamics as a last resort. This is because aerodynamic grip cannot always be relied upon in a racing situation. For instance, if you are closely following another car, there will be less air flowing over your car because the car in front is breaking through the air for you. The reduced airflow (and therefore downforce) on your car will cause you to lose grip. If you rely heavily on aerodynamics to improve handling, your car will become difficult to drive when you are in close proximity with other cars. Aerodynamic components work by deflecting air in a way to create a downward force on the car. Air hits the car at an angle, which pushes the car into the ground. At the same time, the air gets deflected up and over the car. 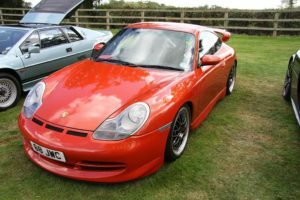 Aggressively sloped front bumpers and large wings will generally create more downforce than small wings and mild front bumpers. Usually, it is not possible to adjust the amount of front downforce without changing your front bumper. However, wings often have inserts and angle adjustments that can be used to change rear downforce. By increasing wing angle or adding wing inserts, you increase downforce on the rear of the car. This pushes the rear wheels more firmly into the ground and prevents them from slipping. Oversteer can be corrected in this way. If your car understeers in high-speed corners, you can reduce the angle of the wing or take out wing inserts to reduce rear downforce and correct the understeer. Keep in mind that adding downforce will help you increase your cornering speeds but will lower your top speed due to the extra drag. Still, you will usually want to maximize the downforce because the majority of road courses do not have very long straights. On a track with long straights, reducing downforce (and therefore drag) may improve your lap times.